The Whiting provides facilities, programs and services to promote and support the presentation of the best regional, national and international performing artists. Each year, The Whiting Presents Broadway, music, comedy, theatre, dance and much more throughout its season. Past performances include Chris Isaak, Kenny Wayne Shepherd, STOMP, Wayne Brady, Itzhak Perlman, Martin Short, Mamma Mia, Cirque Dreams Holidaze, Jeff Daniels, Rain: A Tribute to The Beatles, Sinbad, Rock of Ages, and so much more! 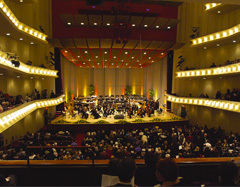 The Whiting's 2,043 seat theater is home to the Flint Symphony Orchestra, Annual Holiday Pops and many other community graduations, recitals, and other events. 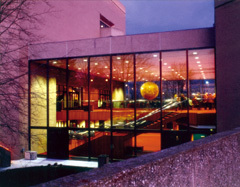 The James H. Whiting Auditorium (as the theater was originally named) was dedicated and officially opened in October 1967. A major renovation in 1999 has restored The Whiting to its former glory, combining the charm and grace of old European theaters with the beauty and comfort of modern day. 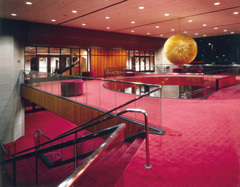 Each year, this 2,043 seat theater hosts the Flint Symphony Orchestra, performances presented by Flint Youth Theatre, and The Whiting Presents, featuring Broadway hits, touring musical and dance groups and guest artists from around the world. The Whiting is named in memory of James H. Whiting, an early pioneer of the auto industry and one of the founders of Flint Wagon Works in 1882. He was made President of Flint Wagon Works and in 1903 convinced his partners to buy the Buick Motor Car Company in Detroit and move it to Flint. Whiting became President while David Buick was General Manager. In 1904, Whiting persuaded William Crapo Durant to become General Manager of Buick and in 1911 he also sold Flint Wagon Works to Durant. Independently, Whiting formed the Whiting Motor Company in 1911 and produced the Whiting car for two years.